Launch from the Baikonur Cosmodrome; landing with Soyuz TM-3 spacecraft 140 km northeast of Arkalyk. It was the maiden manned voyage of a Soyuz TM spacecraft. The Mir space station remained vacant after the departure of the Soyuz T-15 crew on July 16, 1986. In September 1986 the Altair/SR relay satellite Kosmos 1700 ceased operating and drifted off its geosynchronous orbit position. This reduced the station to communications via earth ground stations. The Progress 27 freighter docked with the station on January 18, 1986 and boosted Mir's mean altitude by 16 km to 345 km on January 26, 1986 in preparation for the launch of Soyuz TM-2. At this point only one of Mir's computers was functional. Following a two day solo flight Soyuz TM-2 docked with the Mir-Progress 27 space station on February 07, 1987. 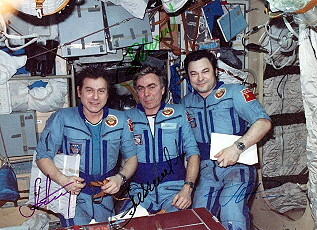 The cosmonauts became the second resident crew. This was first time of using the new docking system Kurs. Kurs was the successor to the IGLA system and today provides navigation beaconing for Russian space vehicles. When used for docking, the Soyuz or Progress vehicle broadcasts radar pulses from multiple antennas. The variation in strength between the antennas allows the system to compute relative position, attitude, and approach rate. 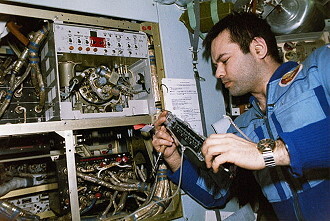 The system is designed for automatic rendezvous and docking, but in an emergency cosmonauts may take command of the vehicle either locally, or from the Mir. Following reactivation of the station and unloading of Progress 27, the freighter departed the station on February 23, 1987. It was followed by Progress 28 from March 05, 1987 - March 26, 1987, which then departed to clear the aft port for the large Kvant space station module. Onboard the Mir the crew performed various scientific research work, including geophysical exploration of Middle Asia, the Kaspian Sea and the Caucasian region, spectralanalyses, production of semiconductor materials with the Korund 1M apparatus (48 different experiments) and photographs of the Earth surface. Other experiments were medical research, research work with fluids, building of metal alloys (copper and silver), plant growing experiments in the Phyton and Rost-apparatus, mounting the MKS-M2 optical spectrometer and a photometer for astrophysical experiments. Early in the Soyuz TM-2 crew stay on Mir, the Kvant1 module was launched to automatically dock with Mir. Kvant consisted of the space station module (11 tons) and a unique FGB based vehicle called the Functional Service Module (FSM) (9.6 tons). The FSM carried out major maneuvers on April 02, 1987 and April 05, 1987. On April 5, 1987 its IGLA approach system began homing on Mir's aft port. The Tamyrs retreated to Soyuz TM-2 so that they could escape in the event the module got out of control. About 200 m out, the IGLA system lost its lock on Mirs aft port IGLA antenna. The cosmonauts watched from within Soyuz TM-2 as the Kvant / FSM combination passed within 10 m of the station. Kvant and its FSM drifted 400 km from Mir before being guided back for a second docking attempt. The softdock occurred early on April 09, 1987. 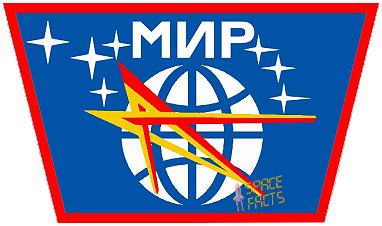 Kvants probe unit would not retract fully, preventing hard docking between Mir and Kvant. The Soviets left Kvant soft docked while they considered a solution. Maneuvers were impossible during this period, because the probe of the Kvant/FSM combination would wobble loosely in Mir's aft port drogue unit, banging the docking collars together. The Kvant ('Quantum') 1 module was the first addition to the Mir core and contained a suite of scientific instruments for astrophysical observations and materials science experiments. The purpose of Kvant1 was to provide data and observations for research into the physics of active galaxies, quasars and neutron stars. The module also supported biotechnology experiments in the areas of anti-viral preparations and fractions. It was about 5.8 m long, had a maximum diameter of 4.15 m, and a mass of about 11 tons. The module was divided into a pressurized laboratory compartment (40 cubic meters total pressurized volume) and a non-pressurized equipment compartment. The laboratory compartment was further divided into an instrumentation area and a living area, which were separated by an interior partition. A pressurized transfer chamber connected the core module with the laboratory chamber. The non-pressurized equipment contained power stabilizers. 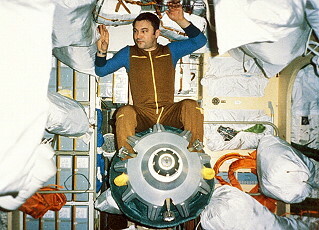 The module was equipped with geodyne momentum wheels to replace the Mir core thruster system for routine attitude pointing. Attitude control thrusters were added to one of the external masts in 1992 to reduce fuel consumption of pointing maneuvers. One solar array wing from the Kristall module was transferred to Kvant1 in 1992. 2 new solar arrays (12 kW total) were delivered in 1995 to replace Kristall array. Initial docking maneuvers were performed by a service module which was jettisoned following docking. 2 Earth horizon sensors, 2 star sensors, and 3 star trackers are used for attitude knowledge. TTM Coded Mask Imaging Spectrometer - a wide-angle camera that used a coded aperture mask to determine source location. It covered the energy range 2-30 keV with a 7.8 deg x 7.8 deg field of view. It could achieve an angular resolution of 2 arcminutes and a time resolution of 1 s.
HEXE (High Energy X-ray Experiment) - 4 detectors that covered the 15-200 keV energy range. The instrument had a 1.6 x1.6 deg field of view and had a maximum time resolution is 0.3-25 ms.
Sirene 2 Gas Scintillation Proportional Spectrometer - a gas scintillation proportional counter that covered the 2-100 keV energy range. It had a 3 x 3 deg field of view with a maximum time resolution of 1.25-2.5 ms.
Pulsar X-1 - 4 phoswich detectors that covered the 20-1300 keV energy range. It had a 3 x 3 deg field of view with a maximum time resolution of 10 s.
These experiments, taken together, are sometimes referred to as the Roentgen Observatory. All 4 experiments point toward the same source at the same time. Glazar UV Spectrometer - covered wavelengths between 1150-1350 angstrom. The instrument could provide up to 1-2 angstrom resolution and has a 1.3 deg FOV. 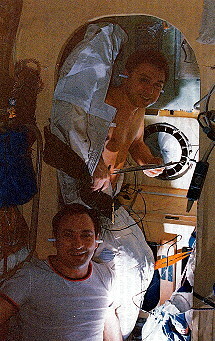 On April 12, 1987 Yuri Romanenko and Aleksandr Laveykin exited Mir for the first EVA (3h 40m). The first Mir space station EVA - only the 19th of the Soviet space program - was a contingency spacewalk to permit Kvant, the station's first expansion module, to complete docking. 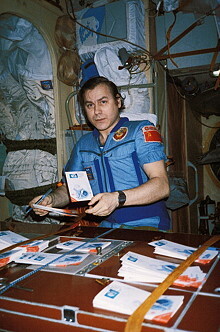 One of its participants, Yuri Romanenko, took part in the first Soviet space station EVA aboard Salyut 6 in 1977, which also involved a docking unit inspection. Kvant arrived at the Mir core module's aft port early on April 10, 1987 attached to a Functional Service Module (FSM) space tug. It achieved soft dock, but full retraction of the Kvant probe proved impossible, and the docking collars remained separated by a few centimeters. 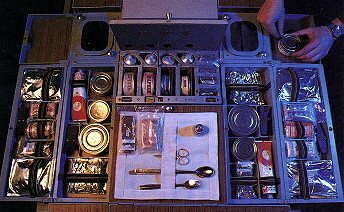 The cosmonauts observed Kvant from Mir's aft compartment viewports, but were unable to detect anything out of the ordinary. The Kvant-FSM combination was left with its probe latched in the aft port's Konus drogue unit while controllers in the TsUP investigated the problem. Attitude control maneuvers were suspended because Kvant might pivot in the Konus drogue, banging together the docking collars. A contingency EVA was quickly authorized, and the cosmonauts spent April 11, 1987 making preparations. Just before midnight Moscow time on this date, Yuri Romanenko and Aleksandr Laveykin left one of the four berthing ports in the forward transfer compartment and moved 13 m (43 ft) along Mir's hull to the aft port. Cosmonauts in the Hydrolaboratory in Star City carried out the procedure simultaneously. 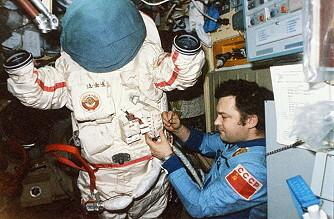 Aleksandr Laveykin's Orlan-DM space suit registered a minor pressure drop, causing momentary concern, but the problem was quickly traced to an incorrect switch setting. Flight controllers extended the docking probe to permit the cosmonauts to examine the docking unit. They discovered an "extraneous white object" jammed between the two spacecraft. This was later identified as a twisted piece of cloth, possibly trash escaped from Progress 28, which had undocked from the aft port on March 26, 1987. 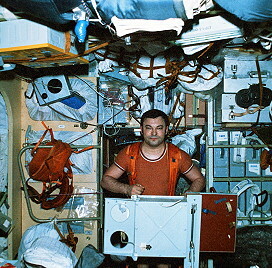 With difficulty Aleksandr Laveykin freed and discarded the object early in the morning on April 12, 1987, the Cosmonautics Day holiday in the Soviet Union. The cosmonauts waited nearby while the TsUP commanded the Kvant probe to retract, completing hard dock, then returned inside an expanded Mir station. The crew entered Kvant on the next day and began unloading equipment into the base block. Kvant added 40 m³ of pressurized volume to Mir, bringing the total to about 130 m³. On April 16, 1987 the pointing motors on Mir's two solar arrays were linked to sensors on Kvant. Kvant carried stowed solar arrays intended to be attached to a fixture on top of the small-diameter section of the base block. Progress 29 arrived and remained docked to the aft docking port of Kvant from April 23, 1987 - May 11, 1987. 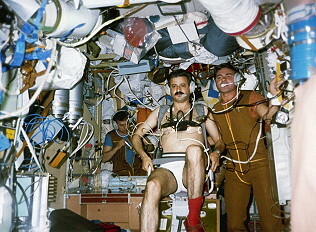 Beginning April 30, 1987, the crew tested orienting the Mir complex using Kvant's gyrodynes. In part this was in preparation for pointing the new module's roughly 1000 kg of astrophysical instruments. During this period, propellant was pumped through Kvant to Mir's ODU for the first time. The Elektron system aboard Kvant, which produced oxygen by electrolysis of water, was readied on May 08, 1987. The USSR acknowledged that Mir was short on electricity. The situation became particularly difficult when melts lasting days were conducted using Korund 1-M. 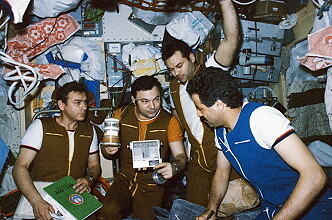 The Mir-2 crew spent most of May 1987 conducting medical experiments and Earth resources photography, activities which required little electricity. Progress 30 arrived and remained docked to Kvant's aft port from May 21, 1987 - July 19, 1987. The second EVA occurred on June 12, 1987 (1h 53m). To save weight, the Mir base block was launched with only two solar arrays. These provided a total of only 9.4kW of electricity, leaving the base block hungry for power. The base block had a socket on top for a third array delivered inside the Kvant module. 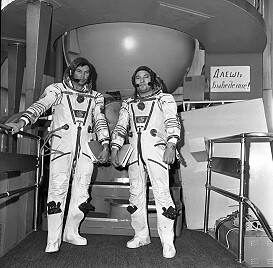 On June 09, 1987 Yuri Romanenko and Aleksandr Laveykin capped a busy day spent studying Supernova 1987A using the Kvant module's Roentgen observatory by undergoing a medical checkup to certify them fit for two solar array installation EVAs. Spacewalk preparations alternated with astronomical observations on June 10 and 11, 1987, and lasted all day on this date. The first installation EVA began late in the evening. Yuri Romanenko and Aleksandr Laveykin attached an extendible "hinged lattice girder" truss to the top of the Mir complex, then attached folded solar panels to both sides of the girder. To test their ability to operate without EVA restraints, Yuri Romanenko and Aleksandr Laveykin employed no foot restraints on this and their next EVA, relying instead on tethers. Aleksandr Laveykin later stated that this gave them "more freedom to maneuver, but we had to cling to the ship with one hand." In the third EVA on June 16, 1987 (3h 15m) Yuri Romanenko and Aleksandr Laveykin placed an extendible truss on top of the one they installed on June 12, 1987 and attached folded solar arrays to either side. They linked the electrical systems of the array sections, then deployed the structure to its full height of 10.6 m (35 ft) "using special mechanisms." Each of the four array sections was made up of eight rectangular solar cell leaves with a total area of about 24 sq m (258 sq ft). 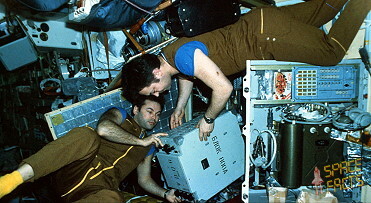 Before going inside, Yuri Romanenko and Aleksandr Laveykin attached space exposure cassettes to Mir's exterior. By June 23, 1987 the cosmonauts completed work inside Mir to connect the new array to Mir's electrical system. The completed array increased available power by 2.4kW. According to Pravda, "[i]ncreasing the capacity of the onboard power supply system helps to increase the effectiveness of the scientific research work on the Mir complex substantially." The Roentgen Observatory on Kvant was uniquely placed to study Supernova 1987a in the Large Magellanic Cloud. The cosmonauts examined the exploding star during 115 sessions between June and September 1987. Aleksandr Laveykin developed heart irregularities which made necessary his early return to Earth. Soyuz TM-3 arrived at the station and docked to the aft Kvant port. It would remained docked to the station from July 22, 1987 - December 29, 1987. The visiting crew observed Syria and conducted materials processing experiments. Syrian guest cosmonaut Muhammed Faris and Soviet cosmonaut Aleksandr Viktorenko returned to Earth in Soyuz TM-2 with Aleksandr Laveykin. 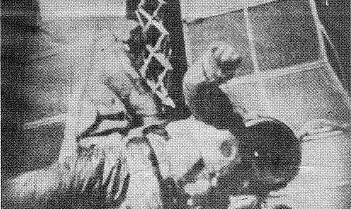 He was replaced by Aleksandr Aleksandrov, who had arrived aboard Soyuz TM-3. 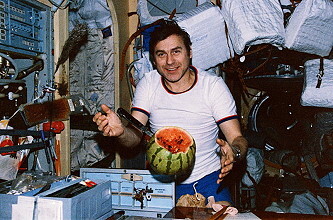 Yuri Romanenko and cosmonaut Aleksandr Aleksandrov performed more than 1000 astrophysical, geophysical, medical, biological and technological experiments. A new long duration record was set by Yuri Romanenko (326 days).